Hope you enjoy these pictures as a pictorial history of Flying Flowers. As you can see this was before we did any plantings in Dec. of 2009. The house, paths and hardscape was completed prior to this snow and notice the snow COATED the shade cloth and barely a flake came through. The covering is a shade cloth not poly. It looked like an igloo, the following snow was much finer and our igloo was no more. This is a side view of our "igloo", with one of our lighter snows. 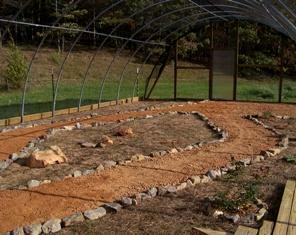 This also shows our row of Lavender planted at the back of the shop/classroom building. When the snow is heavy it coats the shade cloth, as in the picture above. It eventually melts and come through or if it is too heavy Gregg goes out and knocks it off. A wet job! When the snow is heavy it coats the shade cloth, as in the picture to the left. It eventually melts and come through or if it is too heavy Gregg goes out and knocks it off. A wet job but someone has to do it! We are asked why we close in October. Well... look below and see what the property looks like in the winter, you had better bring a 4wheel drive truck. This winter has been a hard one, We have had snow on and off since Dec. These pictures were taken on January 26th, 2011. Enjoy these summer pictures below. Come summer we filled the house with lots of annuals and perennials as both host and nectar plants.Most of the host plants were perennials however most of the nectar plants shown here are annuals for us and are turned to mush after a bad freeze, usually by mid Oct. 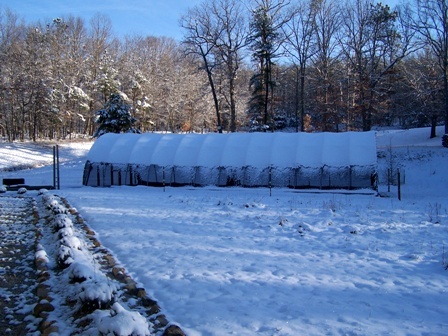 The plants you see in the back of the picture, behind the structure, are one of our Lavender plantings at Beagle Ridge. Lantana is a favorite with most butterflies, here the yellow creeper has surrounded one of the perennials, Blanket Flower. Both bloomed all summer. We were asked continually, how do we have constant bloom with perennials ? Well annuals bloom themselves to death and many perennials will rebloom if we deadhead. Deadheading just means removing the blooms as soon as they no longer look "good". This "tricks" the plant into reblooming. This can take constant vigilance and time, but the rewards are immeasurable. This Lantana was a favorite of mine due to the amazing color combinations. We are presently breeding this and will have lots for you to buy for your gardens this spring. Here are some of the other plants in the structure. The only one the butterflies never seemed to visit was the rose. This was a Knockout Rose a customer gave us and although we enjoyed it all summer I never saw a butterfly nectaring. Maybe because it has been hybrized to be worry free for the garden, but we wanted it for a nectar source. Who knew? Here is a closer shot of the Blanket flower. Notice there are full blooms, buds and a few past prime- calling to be deadheaded. These bloomed from May 10th when they were planted until the first of Nov. when we had a killing freeze. To the right is a shot of our parsley patch, a favorite host plants of several swallowtails. The tall plant behind is is Jerusalem Artichoke. Although the blooms are gone in this picture the blooms which look like small sunflowers are a popular nectaring plant for the monarchs. It is very perennial and all that growth is from June on. We had a little boy step into the bed and break off the shoot when we first planted it and I thought is was lost- Boy was I wrong. Notice how long the parsley sytays green. This was the week after Thanksgiving. Everything else had been severely frosted except for Salvia in one of the blue planted pots. Parsely is still in the house under the snow, not as perky as it is here but we can still pick and use it. PLANT parsley next year! This final shot below was taken on Oct 18th after our first freeze, notice the annuals have succumbed. The perennials are not happy, most of the shrubs have dropped their leaves and we moved some pots to be planted. These are decidous azaleas which provide wonderful nectar early in the season.